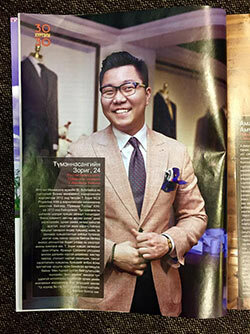 Well-suited in Mongolia | Entrepreneur, CSS grad Zorig Tumennasan named to Forbes-Mongolia's "Top 30 Under 30"
Entrepreneur, CSS grad Zorig Tumennasan named to Forbes-Mongolia's "Top 30 Under 30"
Everything was looking up for newly minted St. Scholastica graduate Zorig Tumennasan in 2012. He had just returned to his native Mongolia to work as a marketing manager and was looking forward to a bright future. There was just one small problem. He was expected to come to work each day in a suit and tie. But the fashion-conscious Tumennasan wasn't satisfied with the typical business suits he found in his country of 3 million people. 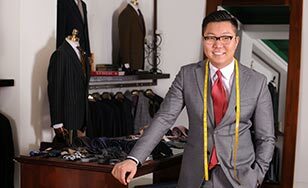 Buoyed by an entrepreneurial spirit and the skills he'd learned as a double major in business management and marketing, he went into business for himself making custom suits for Mongolian professionals. Within just a year, his company, Premier Tailor, had relocated to a busy downtown location in the capital, Ulaanbaatar. The young self-starter found himself within the pages of Forbes-Mongolia's Top 30 Under 30 section. The listing "is such great honor to me," Tumennasan said. "Basically I was the youngest of all the other guys; I'm turning 25 in September. The main reason they chose me was that I introduced a new service in Mongolia with no help from other businesspeople." When he struck out on his own, his business model was clear. "I thought opening a tailor shop which offers almost the same quality as a high-end brand with very affordable prices would be a good business opportunity," Tumennasan said. He points out that among his peers on the "Top 30" list who had studied in the U.S., many attended Ivy League schools.